It was a FULL weekend. SATURDAY we went to Home Depot to get some supplies for the Kitchen Remodel. Then I quickly got ready and headed to Seattle for a Baby Shower, FYI I am an hour South of Seattle. I got back after dark but still needed to get in 3 miles. I let Muscle Man take the treadmill and hit the streets. It was windy and cold, I opted for a HILLY 2 loop run around the neighborhood where it is well lit. My legs were burning by the end but I kept a decent pace. SUNDAY Little Stud #1 woke us with a sounds of yuck...poor kiddo...not sure what caused his tummy troubles. We had work to do!! I stained the unfinished Wood Island and Muscle Man worked on the tile Back-splash. Reno projects take up a ton of time. By mid day we knew we needed to get the the weekly long run, the is the start of training so long run is 5 miles. We set out to a stormy sky and COLD. The rain cover is saving the boys, they stay nice and warm. LS #2 fell to sleep instantly. It was windy on the way out. We traded off pushing the boys so Muscle Man can get practice without the stroller. They are HEAVY. We kept an OK pace, for now he just needs time on his feet. I am hoping we can recruit babysitters in the future as the runs get longer.. 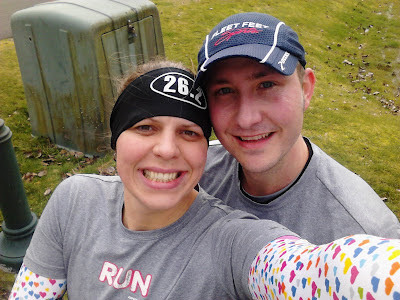 I am loving time with my husband on the run.. Although running with a guy is different. Anchorman quotes and my running ahead so he could clear his nose (GROSS). All in all he is a great running buddy and I LOVE that he is getting excited about his training..
Back to work... Hello Monday. What do you have planned for runs this week? I love that you two run together with the boys! Mel - is that an undershirt or sleeves? Either way, I love it! Cute! I wish I could get my hubby to run, I would love to run with him. That's so awesome you guys were able to fit the run in despite your busy weekend! We have a long weekend so we're off today (Mon). Weekend was the usual, missed group run but still ran Sun am - 8k on my own, no music, longest distance yet. Happy. Today we have a playdate, so it will be fun! as my youngest daughter says, "I'm pretty without make-up. And you are too." I usually forget make-up and never wear when I run. Should I? How fun to train with your husband!